…of cupcakes. Well, to be more precise I’m full of cupcake hats. Using leftover yarn from other projects, I finished these last week but only got them photographed yesterday. The hat with the light buttercream icing is for a 5-year old. The one with the rich, chocolate icing is for her 16-year old sister. I’m not sure if the 16-year old really wanted the hat or if the mother wanted her to have the hat. I cast on 8 more stitches for the larger hat, knit the ribbing another inch and started the decreases when the hat was 9-inches from the cast on edge. I used a different method for the bobbles than the original pattern calls for and I don’t remember where I got the instructions. The bobbles are 5-stitch bobbles, which means that each bobble has 25 stitches in it resulting in one row with 560 stitches. I’m not a fan of bobbles. The buttercream icing hat has a total of 4,363 stitches including the cherry. 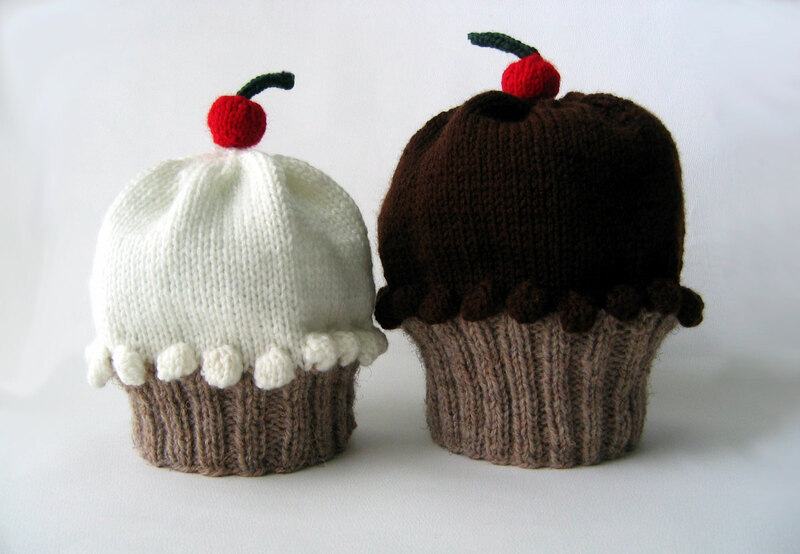 The chocolate hat has 6,112 stitches including the cherry. This entry was posted in finished object, knitting and tagged hat, knitting by Patti_is_knittinginflashes. Bookmark the permalink. Your hats are beautiful. Who wouldn’t like them.